I would like to resurrect the Computer Mouse discussion that was posted November 1-4, 2016. In that discussion I said I used a roller ball mouse but was still suffering from it. Well, it has gotten to the point where I have actually been physically maimed by my hypersensitivity to the mouse. Yes, electromagnetic frequencies can cause physical injury. I cannot use optical mice, they give off high EMF's. I tried to use a trackball I had to see if it would give me some relief, but it was apparently an optical one and gave me problems right away. I use shielding gloves from Less EMF and a piece of shielding fabric draped over my roller ball mouse but it has no effect. I am wondering if there is some kind of dirty electricity that is causing it or if it is just a sensitivity to the EMF's from the mouse, especially magnetic? I have been using computers heavily since desktops first became widespread in the early 1980's. I have a computer degree, I have worked in offices at computers for 20 years. So I have had my hand on the mouse most of my life, mostly an optical one, and they never bothered me up until the last few years. The roller ball mouse has been bothering my right hand and arm, with volts shooting up my arm, and making my knuckles arthritic so that they click when i bend them, so i switched to the left hand. Was using the roller ball mouse on the left hand for about 8 months when suddenly one day, my thumb and base of the hand below the thumb swelled up and I couldn't bend my thumb. I thought it would go away so I let it go for two months but it didn't change and seemed to be getting worse. So I went to the Hand Clinic and saw a Hand specialist for a 15 minute appointment. Because I couldn't bend my thumb, he said it was probably trigger thumb and he gave me a cortisone shot in the thumb to bring the swelling down. The same thing happened on the right hand about 8 years ago and the cortisone shot worked. (I didn't reallze it at the time, but that injury was most certainly caused by the mouse, before I realized I was even sensitive to the mouse. Which means you can be injured by EMF's even if you don't feel them). Well the cortisone shot in the left thumb did not work, and made the swelling worse. So I have an appointment to go back in but he already said, the only alternative would be surgery. In the meantime, in order to use the computer I switched the mouse over to my right hand. But now I am starting to get the same injury starting up in the exact same place on the right hand as happened on my left hand (and which happened 8 years ago). The pain and swelling are right where you rest your hand on the mouse between the thumb and forefinger. So the EMF's are really beating me up. IN addition, while I was using the mouse on my left hand, I also tore my rotator cuff in two places on the left arm, then the thumb injury happened a couple months later. Also, I have acquired a horrendous fungus infection throughout my body and am trying to deal with it right now. Coincidence? I think not. Yes, I know for certain that the EMF's going up my arm are causing these injuries and I can't continue to use the mouse without further injury. I am also starting to have pain in my right breast since I started using the mouse on my right hand. Continuing to do this could lead to breast cancer, thyroid cancer, colon cancer, who knows? Maybe I already have it and don't know. But I know one thing, REAL injury can result from this electricity, especially if you are hypersenstiive to it, but apparently even if you don't know you are. The bastards who make this toxic crap should be sued. I have tested the mouse and keyboard with the Gauss meter and the RF meter and there appears to be no excessive levels, so it is either dirty electricty, and /or hypersensitivity to low levels of EMF from the mouse, especially magnetic frequencies. My question is, has anybody investigated mouse alternatives? I imagine anything that requires hand and finger contact with a device could create a circuit with the body. I thought the touch pad or a WAACOM tablet would be better, but they are still wired and EMF and/or dirty electricity could still be travelling up the wires. Do you think they would be lower in EMF's than a roller ball mouse with a scroll wheel? What about touch screens? Does anyone know of wired monitors that can use touchscreen technology? i know iPads, Tablets and iPhones use touchscreen technology but they are wireless and touching the screens would kill me after awhile. What about head sets that paraplegics use to create cursor movements with their eyes. I suppose those headsets are really high in EMFs since it is reliant on electronics in the headset. Amazon has a AGS Laser Projection Bluetooth Virtual Keyboard & Mouse for Iphone, Ipad, Smartphone and Tablets on sale. It was originally $169.99 now only $31.99. I know it is wireless, but do you think there would be some way to make it wired to a USB? The concept of having a projected keyboard and mouse would be a good way to keep from having your body contact the device that is emitting EMF's. Of course, I do not know if the lazer light would be a problem. And considering the price reduction, I wonder if they work that well. I am extremely active on the computer and do a lot of typing and mouse action. you can see the four options that are available for magnetic shielding and how effective they are. Papershield is pretty useless. And I know a pair of gloves can't be made from Giron. In addition, after I use the computer for 3-8 hours, my body voltage is high and I feel itchy and aching all over from the EMF's that have built up in my body - can even feel sharp pains. This situation has become a life or death situation for me. If I continue to use the computer mouse, I will die or end up maimed and disabled. What does a computer addict do when they can no longer use the computer? I have to find a mouse alternative. Please, anyone have any ideas. I have limited ability to research the situation right now. Don't want to loose use of both hands. You never know how important a thumb is until you can't use it anymore. like you i have very bad health problems. I searched a long time for tolerable devices and found none. I tested an "Acer Airkey Wireless keyboard with integrated mouse"
with no luck. i also tested ball-type mice, with similar bad result. i tried and it works, but my mouse separators work much better/faster for me, so i don't use it. and so try really hard to find/make a solution. I've tried a lot of computer mice over the years, and have concluded that if a roller ball mouse is bothering me, it's the fault of the computer, not the mouse. I've used the same exact mouse on two different PCs -- on one PC it cause me problems, on another PC no problem at all. 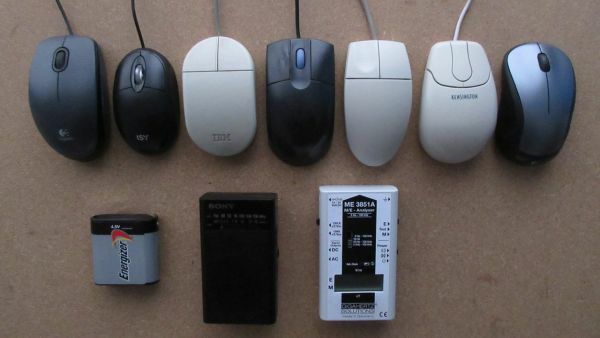 I suspect poor-quality electronics feeding the mouse, or a poor-quality power supply. So my solution has been to use higher quality PCs, designed for professional / industrial use. For example, Lenovo and Dell make such PCs. Right now I have a Lenovo at home, and a Dell at work. And amazingly, both of these still have PS/2 ports, so I'm able to use really old PS/2 keyboards and mice. Thank you for your reply Merializer. Wow! That is some contraption you have made for yourself. I have never seen anything like it and would never have thought of it. It seems excessively complicated for me to make and now that my hands are messed up, I have trouble with power tools as well as minimal space in a cramped apartment. Your device is a statement on how far people have to go to try and subvert exposure to dangerous electro-pollution from shoddy cheaply designed electronics that the industry has knowingly put on the market with no regard for human safety. Where are the safety standards? The only way to get these standards changed is for the people who are being injured by these products to join together and file a class action lawsuit. I am convinced that engineers could design these products to be much safer, but the industry doesn't want to spend even a penny of extra money for shielded wires, shielded components and better connections. The current political climate of human exploitation and depopulation does not help. I would like to consult with an engineer to discuss mouse and monitor remediation. We''l see if that gets anywhere. Mark, you said " I have concluded that if a roller ball mouse is bothering me, it's the fault of the computer, not the mouse." Could be, and I will try to rearrange things, but I suspect it would bother me no matter what the hook up arrangement because I have been sensitized to the very frequencies being emitted by it. Yes the roller ball mouse emits less frequencies that other mice, but they DO emit frequencies. After 30 years of having my hand on computer mice, my body has been "electrocuted." Merializer, thanks for the video. My hand has felt much less pain since switching to an old HP PS2 ball-type mouse, so I wonder how much noisy the other painful mouse was. PS/2 port ball type mouse - IBM 13H6690 & MO42KC - EMF and shielding tests with 1200586 radio. Well, the other mouse died while testing before i made the video. It fried by using a apparently low quality or malfunctioning usb to PS/2 converter. I can completely relate to your plight. I truly believe I have done permanent damage to my right hand as a result of "pushing through" the pain in order to meet deadlines etc. As a Mac user I was forced to give up the Bluetooth mouse for their wired optical alternative and now I can barely even cope with that. Personally I have found my reactions to be greatly reduced when using a wired mouse connected to a laptop powered via its battery (completely disconnected from the mains). Have you tried this? You may need to abstain from electronics completely for a bit before in order to test this objectively. I think your are right regarding the dirty electricity, more specifically I believe the main culprit to be PLC (power line communication) from smart meters such as those using TWACS (Two-Way Automatic Communication System) as well as the growing use of Broadband over power line technology in neighborhoods. Unfortunately I have not had the opportunity to test this hypothesis by powering a computer with interdependently generated electricity over a system that is truly disconnected from the grid. See that the keyboard as well as the mouse do not have shielded cables. When they are shieldid, the dirty frequencies can not evade, and come out at the devices. i tested 7 mice including mechanical mice. compared to connected to a computer. Let me know when you test mice how they feel.